Intermittent asthma is the least severe type of asthma. At times, it may be referred to as "mild intermittent asthma." People with this type of asthma typically have asthma symptoms that come and go. If you have this type of asthma, you experience episodes twice a week or less with nighttime symptoms occurring at most twice a month. Between episodes, it's likely that you will not have any symptoms and your lungs function normally. Though it is mild, it's still necessary to receive proper treatment to manage your asthma. What Are the Classifications of Asthma? The different classifications of asthma are based on the severity of the condition and the classification of anyone's asthma can change over time. It is difficult to diagnose and classify in children younger than 4 years old since symptoms may be different from those in older patients. When determining which classification to assign to your asthma, your doctor will consider your symptoms prior to treatment. This includes difficulty breathing, wheezing, chest tightness, and coughing. They will also look at the results of a lung function test or pulmonary function test to determine the amount and speed of air you can blow. The National Asthma Education and Prevention Program has classified asthma into four categories. These are listed in order of severity, with intermittent asthma being the least severe. Severe asthma attacks are possible in any asthma classification, even intermittent asthma. How Is Asthma Classified as Intermittent? Intermittent asthma is the most common type of asthma. Even though this is a mild form, it is important to realize that treatment is still necessary. By managing mild intermittent asthma properly, you can reduce the risk that it develops into a more severe form. Specific guidelines will help your doctor determine that your asthma is intermittent. Your asthma symptoms occur two days or less per week. This includes the need to use a rescue inhaler. Your asthma does not interfere with normal activities. Nighttime symptoms occur two days or less per month. When you are not having an asthma attack, lung function tests are normal. Test results vary little from the morning to the afternoon. People with intermittent asthma do not need daily asthma controller medications. Instead, your doctor will typically prescribe a quick-relief bronchodilator like an albuterol inhaler. This inhaler opens up your airways and is used only as needed (up to a maximum of four times in a one-day period). Your doctor will also work with you to develop an asthma action plan. This includes monitoring symptoms and how severe or frequent they are. It also helps you recognize early warning signs of an attack and identify your asthma triggers. Asthma is different for every person and so is managing it. Many people with asthma may find that their severity of asthma fluctuates over the years. As severity changes, so do medication and treatment, which is why it's important to discuss everything with your doctor. The ultimate goal is to keep your asthma under control and ensure that it interferes with your life as little as possible. National Heart, Lung, and Blood Institute. 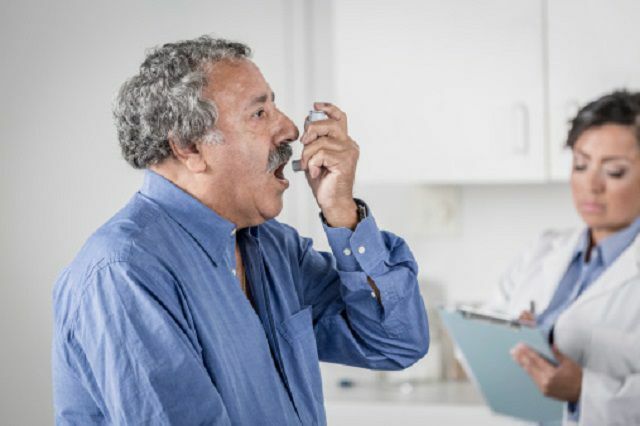 Asthma Care Quick Reference Guide: Diagnosing and Managing Asthma. U.S. Department of Health and Human Services, National Institutes of Health. 2011.